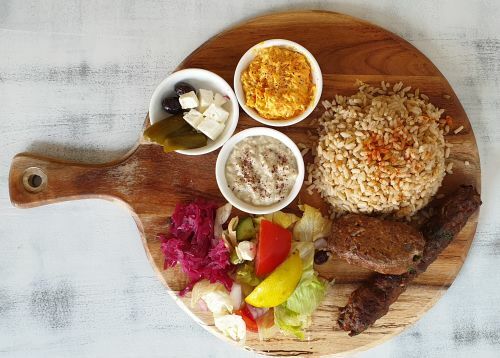 Menulog delivers for Gozleme Cafe so you'll be able to track your courier on a map. Chicken or beef cooked with onions, green capsicum served with your choice of sauce, chilli garlic or BBQ. Served with falafel hummus and falafel wrap. Chicken, beef or veggie served with lettuce, tomato and onion. Classic vegetarian Turkish breakfast cooked and served in copper skillet. Fava beans and feta cheese cooked in sahan. Served with Turkish. Feta cheese and eggs served with Turkish bread. Herbed beef mince served with eggs in sahan and Turkish bread. Herbed mushrooms and cheese with egg. Served on Turkish bread. Served with chicken or salmon, olives, baby spinach, mushrooms and Turkish bread. Skewers of cherry tomato, cucumber, assorted jams, olives, feta cheese pastrami, boiled egg and Turkish bread big breakfast. Turkish breakfast accompanied with either menemen, sucuk or kymah and eggs. Feta cheese and baby spinach. Beef mince onions, parsley and black pepper. Chicken, roasted red capsicum mushrooms, Kalamata olives and cheese. Potatoes, chili red capsicum salsa and onion. Chocolate and walnuts topped with banana and icing sugar. Your choice of gozleme served with two dips and salad. Potatoes, chilli red capsicum salsa and onion. Your choice of borek served with two dips and salad. Traditional black tea served in Turkish cups. Served in traditional Turkish cups. Hot creamy drink dusted with cinnamon.